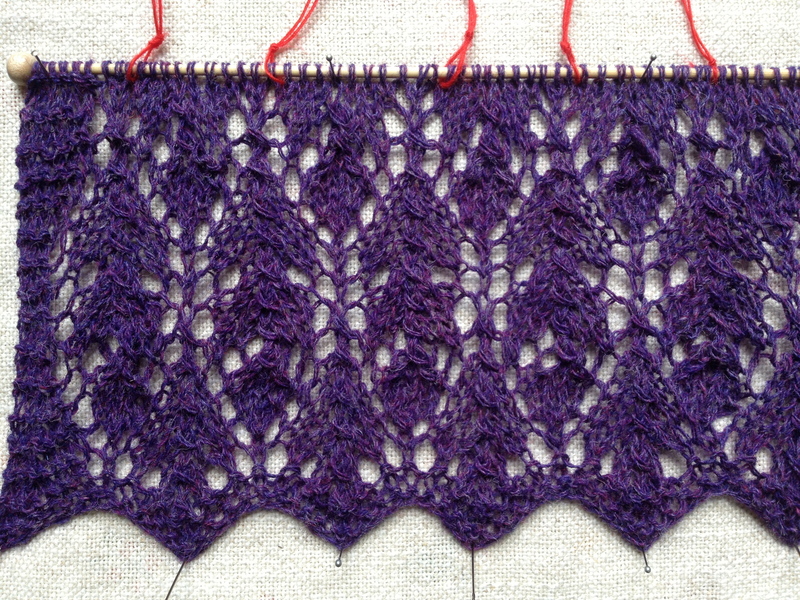 In the recent days there have been a few hic-ups, but the Thistle scarf has finally made some progress. 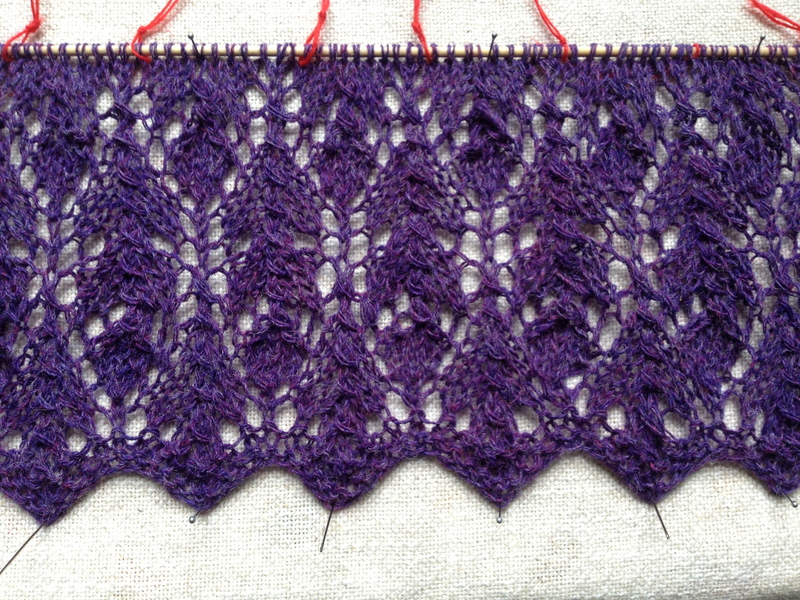 I completed the first repeat of the lace section. Six more to go! The Shetland yarn I’m using is 100% Shetland 2-ply wool, used double stranded, and seems to have a different look from that originally used in the pattern (Juno Fibre Arts Belle, a sock weight 4-ply 70% alpaca 30% wool). It is thinner and gives a somewhat rougher stitch definition – though this may change once the wool is washed and blooms. 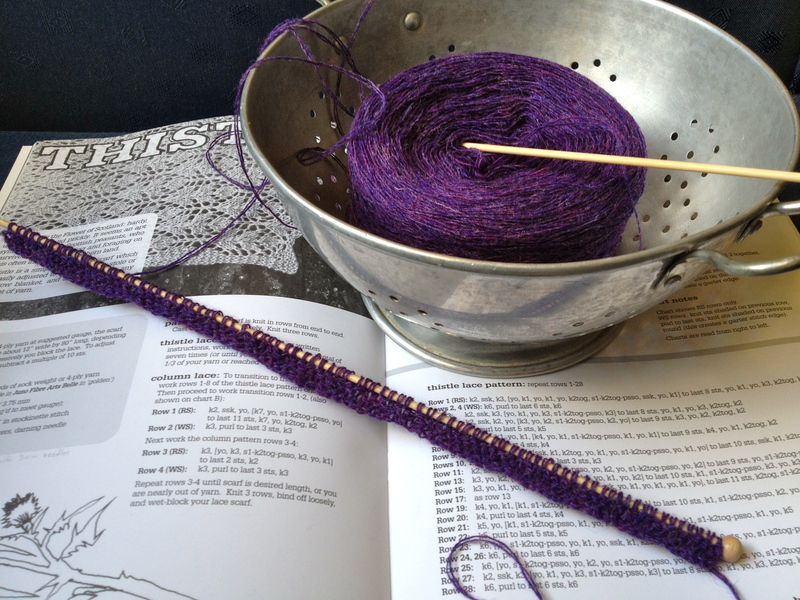 In any case, the scarf is a bit of an experiment with this yarn and I’m looking forward to see the outcome. Looking at the close-ups below, I think that there are a few mistakes: in a few points the stitch doesn’t seem to align with the overall pattern. I’ve been quite careful in checking the stitches and used stitch markers (I mean those funny things, home-made out of red wool yarn!) to make sure the repeats within each row are correct. Thus, I’m wondering whether some stitch has been knitted in a slight different way from what it should be? I’ll post an update when the lace section will be more advanced and by then I will see whether it was a one-off mistake or an actual error in interpretation. P.S. A small parenthesis here that is not related to the knitted item and hence it’s an optional read. It may take a bit before the next step because both myself and my other half have been unwell: for me it’s just an annoying cold, but my partner had to be treated at the A&E for a severe asthma attack. He had ongoing issues with asthma, but those escalated to a level that it was a problem even to get to the hospital by taxi… I have to say a HUGE THANKS to the doctor and nurse personnel at the emergency: they made an incredible job and rescued him in a life-threatening situation. Despite the government attempts to hatch the National Health Service (pardon, I think they name it “open the service to the private sector”), may our NHS live long, healthy and free for everyone!